Parenting children in their twenties is harder than parenting them when they’re younger – at least that has been my experience. It requires responsiveness, resilience, adaptability and great unattached, unconditional love – which is easier to say than live at times. And the transition of the parenting role can be unexpected and different than the empty nest syndrome. If you have children in their twenties (or have been through that stage) and just did that wide-eyed look of dawning comprehension because some of your experience just got named for you, that is the look I’ve been getting from friends when I say this out loud to them. They know. They understand. Like me, it hasn’t been a conversation they’ve had in exactly this way and naming it brings relief. When I mentioned to my older boys’ father that parenting the kids in their twenties is harder, he laughed. “That’s because we thought we’d be done by now,” he said. There is some truth to that. And it is more than that at the same time. When your children are born, people will warn you about the terrible two’s and the rebellious teen years. Never once did I have someone say to me, wait until they are in their twenties! Not once. Yet, this age offers interesting and unexpected challenges from a parenting perspective. These young adults are ready to be independent and launch their lives while at the same time still needing support, although they, and consequently you, are not exactly sure what that looks like. And the journey to independence is not straightforward or a straight line. It is fraught with missteps along the way. This journey needs to be acknowledged and not over dramatized. It is just the journey of life unfolding as it does. These young adults, our children, may ask for support and balk at it at the same time. They may want to be close to extended family and want to be left alone to live their lives – and who can blame them. As a parent, feeling the sometimes contradictory energy and tuning into how best to hold that space can be a challenge – because we love our kids, we only want the best for them and we want our family connections to stay (or grow) strong. Understanding how to hold family close and lightly at the same time, as a parent, is new learning. Hold it too tight and you risk pushing loved ones away. Hold it too lightly and you don’t end up honouring values that are important to you. Lean in too close and it is suffocating. Lean out too far and there is less substance and connection. 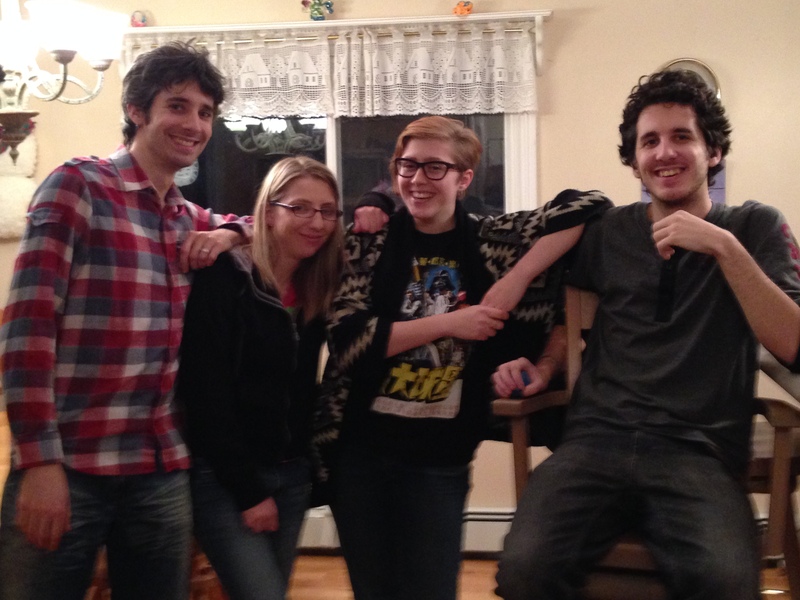 My twenty-something sons and their partners. As we navigate a new stage of relationship it is important to hold that space with love, to extend love, to not take the quest for independence personally or be offended or hurt at times. Keep inviting – true invitation, not insistence. Celebrate the next stages of life – yours and theirs. Both my twenty-something year old sons are in long term relationships, living with their partners, launching the next phases of their lives. I’m proud of them and cherish the relationships I have with all four of them. As a bit of an independent leaning individual myself, I value their own journeys and want only the best for them. I want them each to be and continue to grow into their own uniqueness as individuals. I suppose there is also some grief from time to time mingled in with the celebration, which surprises me a little although maybe it shouldn’t. It is the need to let go of previous stages of attachment and relationship to be open to what will serve best now, in recognition of new stages of maturity – of all of us as individuals and in our relationships with each other. Everything moves in cycles. It is important to remember the ebb and flow of things as you hold intention for your family connections. One thing I learned when the kids were younger was to not project current (unwanted) behaviours or patterns onto the future as if the future would simply be more of the now. Life offers us the opportunity for our relationships to grow and mature. What that looks like with our kids in their twenties is different than what it looked like when they were younger and is likely different than what it will look like when they are in their thirties and forties (I don’t know for absolute sure because I haven’t gotten there yet). I know I have a new appreciation and respect for my own parents and I have a new appreciation for my twenty something kids as they continue to be my teachers in this openhearted journey of life.